Born in Grodno into a family of laborers. He studied until age thirteen in a religious elementary school, and thereafter he studied tailoring. Involved in the Bundist movement, he was forced in 1905 to flee Russia. 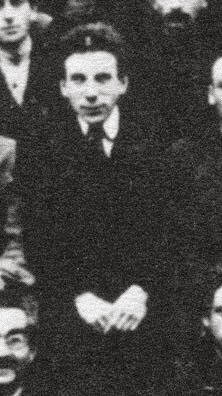 He settled in Leeds, England, and from there he wrote correspondence for the anarchist publication, Arbayter fraynd (Workers’ friend). In 1905 he left for the United States. From 1913 he worked as an insurance agent in Chicago. He also contributed to the local Yidisher arbayter-velt (Jewish workers’ world) and to Fraye arbeter shtime (Free voice of workers) (New York). In 1917, together with a group of Russian political emigrés, he traveled to St. Petersburg and took part in the organization of the Bolsheviks’ Jewish Commissariat. In late 1918 he became commissar for Jewish affairs in Vitebsk province. As a provisional representative of Jewish commissar, Sh. Dimantshteyn, in Moscow, he published the decree regarding the closing down of Jewish community bureaus. In August 1919 he returned to the United States where he published articles about Soviet Russia. He then turned around and came back to Russia where he edited books, newspapers, and magazines. He wrote for the Soviet Jewish press also under the pen names: Ben-Khayim, Shmuel Sinier, and Shmuel Alef. In the first number of the first Soviet Yiddish newspaper, Varheyt (Truth), he published an article about Yoysef [Joseph] Bovshover. In 1918 he published poems by Bovshover with his own preface (32 pp.). He also wrote about Dovid Edelstat (David Edelstadt). In his literary critical essays, he stood for “rehabilitating the proletarian tradition in Jewish literature.” For many years he served as the director of the party archives for the Central Committee of the Communist Party (Bolsheviks) in Byelorussia, as well as a contributor to the Minsk Institute for Jewish Proletarian Culture. On the basis of very little knowledge, he wrote a great deal about topics in political history and literary history, especially the Bund, and about the Jewish role in the Russian Revolution and socialist literature in Yiddish. He also wrote articles for Shprakhfront (Language front) (Kiev) and Lingvistishe zamlungen (Linguistic compilation), vol. 2 (Minsk). From 1948, his fate—as well as that of other Soviet Jewish writers—was unknown. His books include: Di badaytung fun der ershter idisher komunistisher konferents (The significance of the first Communist conference) (Vitebsk, 1918), 11 pp. ; Der yidisher arbeter in der komunistisher bavegung, 1917-1921 (The Jewish worker in the Communist movement, 1917–1921), with a forward by Sh. Dimanshteyn (Minsk, 1925), 176 pp. ; Di yidishe komisaryatn un di yidishe komunistishe sektsyes, 1918-1921 (The Jewish Commissariats and the Jewish Communist Sections, 1918–1921) (Minsk, 1928), 460 pp. ; Afn historishn front (On the historical front) (Moscow, Khakov, Minsk, 1930), 175 pp. ; Di revolutsyonere bavegung in Vaysrusland, 1863-1917 (The revolutionary movement in Byelorussia, 1863-1917) (Moscow, 1931), 270 pp. ; Der moskver proletaryat af der barikades, 1905 (The Muscovite proletariat at the barricades, 1905) (Moscow, 1931), 54 pp. ; Di oktyaber-shlakhtn in moskve (The October battles in Moscow) (Moscow, 1933), 116 pp. ; Di sotsyalistishe literature af yidish in 1875-1897 (Socialist literature in Yiddish, 1875-1897), vol. 2 (Minsk, 1935), 425 pp. ; Der kamf kegn bund (The struggle against the Bund) (Moscow, 1935), 253 pp. Agursky also translated (and wrote the introduction) to V. Knorin, 1917 yor in vaysrusland un afn mayrev-front (The year 1917 in Byelorussia and on the western front) (Minsk, 1927), 96 pp. He edited: Der frayer arbiter (The free worker), daily newspaper, organ of the Communist-Bolsheviks (Vitebsk, 1918), published from November 7, 1918 to April 11, 1919; Komunistishe velt (Communist world), political-literary magazine, semi-monthly organ of the Central Committee of the Community Party (Bolsheviks) and the Central Bureau of the Jewish Sections (Moscow, 1919), published from May 1, 1919 to April 1920; Kamfs-gezangen (Songs of struggle) by Morris Vintshevski (Morris Winchevsky) (Minsk, 1924), 24 pp. ; Der shtern (The star), monthly magazine, together with B. Orshanski, B. Osherovits, Izi Kharik, and others (Minsk, 1925); 1905 in vaysrusland (1905 in Byelorussia), a collection (with a forward) (Minsk, 1925), 225 pp. ; Di oktyaber-revolutsye in vaysrusland (The October Revolution in Byelorussia), a collection (Minsk, 1927), 360 pp. ; Lider fun kamf un noyt (Poems from struggle and hardship) by D. Edelshtat (with an introduction) (Moscow, 1930), 180 pp. ; Geklibene lider (Collected poems) by Bovshover (with an introduction) (Minsk: “Tsenter” [=Tsentraler yiddisher komisaryat], 1931), 190 pp. ; Afn visnshaftlekhn front (On the scholarly front), bulletins from the Institute for Jewish Proletarian Culture of the Byelorussian Scientific Academy (Minsk, 1932-1935), nos. 1-8; Lenin kegn bund (Lenin against the Bund), with an introduction (Minsk, 1933), 67 pp. ; Kegn bund (Against the Bund), a collection with articles by Agursky and others (Minsk, 1935); Geklibene verk (Collected works) of D. Edelshtat, three volumes (together with A. Levitan, K. Marmor, and M. Erik) (Kiev, 1935) (the third volume never appeared); Geklibene verk (Collected works) of Morris Winchevsky, six volumes (together with M. Levitan, K. Marmor, and M. Erik) (the fifth volume, Dramas, Minsk, 1935), 278 pp., other volumes never appeared; Izi kharik, tsu zayn fuftsik-yorikn dikhterishn veg (Izi Kharik, on the fifteenth anniversary of his poetic path), a collection (Minsk, 1936), 136 pp. Sources: Z. Reyzen, Leksikon, vol. 1, p. 41; D. Tsharni (Charney), A yortsendlik aza (What a decade) (New York, 1943), pp. 227, 250-53, 296; Yankev Leshtsinski, “Stalin un de amol barimte ester fun bund” (Stalin and the once famous Ester of the Bund), Forverts (New York), February 27, 1932; K. Marmor, in Dovid edelshtat gedenk-bukh (Dovid Edelshtat memorial volume) (New York, 1952), see index; Aleksander Pomerants, “Edelshtat in der sovetishe-yidisher literatur-kritik” (Edelshtat in Soviet Yiddish literary criticism), Dovid edelshtat gedenk-bukh (Dovid Edelshtat memorial volume) (New York, 1952), see index; Sovetish heymland, Materyaln far a leksikon fun der yidisher sovetisher literatur (Materials for a handbook of Soviet Jewish literature) (1937).